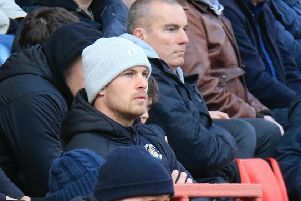 Hatters boss Nathan Jones has confirmed that midfielder Alan McCormack has returned to full training once more. The 34-year-old hasn’t featured for Luton since their 2-1 win at Wycombe in September after suffering from groin and calf injuries, but along with club captain Scott Captain, who has been missing since November, are close to a return. Although tonight's game against Wycombe could be slightly too early for the pair to make their comebacks, Jones said: “McCormack’s back in full training, Cuthbert’s closer, whether they are for ready for Wycombe is one thing, but we’re in a slightly better position than we were. “If he (McCormack) stays like that he will be (a big boost), but what we don’t want to do now is for him to break down again, because that’s happened a couple of times. “So it would be good to have him back and have him involved and ready to impact because it’s an important position for us and we brought him in to play games. “We’ve missed him in terms of not having that influence there, so hopefully we can have him back. There was better news surrounding Harry Cornick who had to go off during stoppage time in the 1-0 win at Grimsby on the weekend, as Jones said: “It was more cramp than anything. “The thing with Harry is he never stops running and his high intensity running is through the roof. “Him and Hylton are on another level in terms of that, so he had cramp late on and was a little bit immobile, so that’s all that he had. However, midfielder Luke Gambin remains a doubt, with Jones adding: “He’ll be touch and go, whether we risk him or not is another thing as we want him ready for a number of games. “So it’s difficult to put him back too early especially with a little ankle roll.